Now, cassettes hold spare bills — you know, the things you used to save up to buy tapes. Continuing in the spirit of cassette tapes, here are two more cassette items. 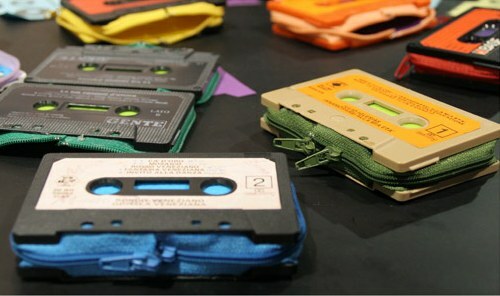 Completely useless, but somewhat amusing: Designboom’s Cassette Wallet recycles old cassette shells into zippered money holders. If you’re looking to get your retro chic on, they’re $43. Or, if you find some lame tapes as you’re rooting throw your collection for the Cassette Jockey Competition at Maker Faire, you can try to figure out how to recycle it into something like this and sell it for $43. Via the Spanish-language JP-Geek, Sweden’s English-language Fosfor, and a site you already know about. In the domain of the musically functional, Roland from Munich wonders if cassette players with pitch control could be the perfect addition to a digital studio. Just saw your post about cassette players and wanted to ask if you know of any old commercially-available players that allow you to set the playback speed manually (maybe some professional model?). Could really use that for sampling since I am not a big fan of the digital algorithms available. I’d love to hear some reader thoughts on this. Does this sound better than digitally changing the speed? Yes, it does — even on a cheap portable Sony, the added noise is still outweighed by a more accurate pitch shift when it comes to radical changes. There’s just not enough data in a standard-resolution audio files to effect big speed changes. Not to mention, there’s something satisfying about the ritual of working with tape, and you might want some of the coloration of tone your recorder provides. I suspect your options are really wide open here, so let’s ask the readers: got a cassette recorder that’s handy for pitch changes? And for the record (erm, tape? ), yes, I do know some people who still listen to cassettes, without any pretentions of retro chic.